Palomar Mountain State Park, acquired in 1932, was one of over 30 new California State Parks between 1930 and 1935. As in almost all of these new parks, the CCC developed the initial infrastructure. At Palomar Mountain, that included roads, trails, bridges, buildings, a pond, water systems, campgrounds and picnic areas. They also worked on other tasks in and around the park, such as building the road and telephone lines to the Palomar Observatory site, insect control, brush cutting for fire prevention, constructing a fire lookout, and of course firefighting. The following photo is of a 1934 fire in the valley below the mountain. 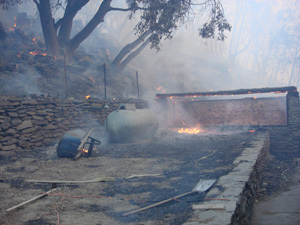 In October 2007, the Poomacha fire, which also started in a valley near the base of Palomar Mountain, swept up the south slope, burning brush and trees and destroying structures in the southern part of the park. 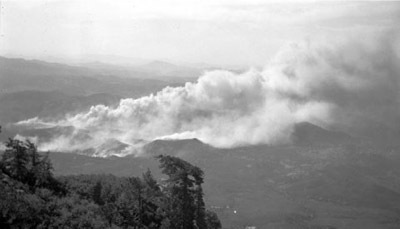 The Poomacha fire burned over 49,000 acres total, including over 1,000 in Palomar Mountain State Park. It destroyed a garage (right) and picnic tables built by the CCC. You will see some of this destruction as you tour the park, and also some of the CCC features the firefighters were able to save. The effects of the Poomacha fire on the park are most evident in and around the Silvercrest picnic area. 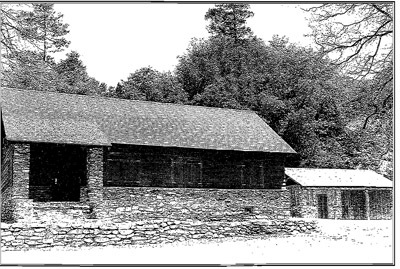 Some of the picnic tables built by the CCC were destroyed at the edges of the picnic area, but firefighters were able to save the picturesque groupings of stonework tables and benches built around three impressive heritage trees in the center of the picnic grounds. This picnic area also contains two two-way camp stoves and one four-way stove, as well as individual camp stoves built by the Cs. 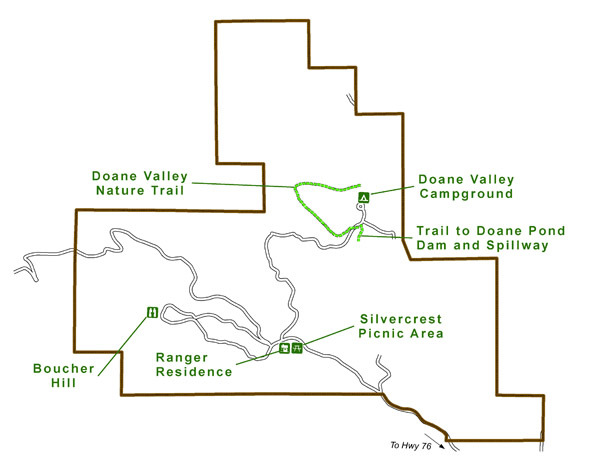 Traveling down the road to Doane Valley you will leave the fire area. As you cross over the bridge into the campground area, look to the right—you will see part of the elaborate rockwork spillway the CCC boys built for the Doane Pond dam. 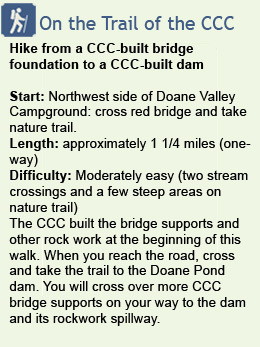 The CCC built the pond and the dam to add to the recreation resources of Doane Valley. The pond is a popular fishing spot. Continuing on, you will see the pond itself to your right, and then enter the pleasant, shady Doane Valley campground. The campground features terraced campsites with extensive rockwork retaining walls and stairs built into the hillside by the CCC. As is fitting for the park rustic style of architecture used in CCC projects, the rock walls blend into the natural stones of the area, even using some stones that were already there as part of walls. 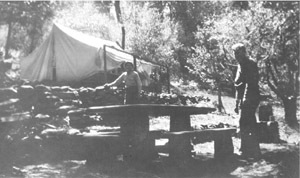 Many camp stoves and tables built by the Cs are still in use in Doane Valley. At the beginning of the nature trail, on the northwest side of the campground, you will see more extensive rockwork on the creek banks and on the supports of the trail bridge from the campground. The wooden bridge itself is a more recent replacement, but is built in the shape of one that the Cs constructed in the park. The CCC developed this road around Boucher Hill as a scenic drive. Take time to stop at the top and walk out to the view deck, which is also wheelchair accessible. To the southwest, over 4,500 feet below you, lies the verdant Pauma Valley. Equally stunning sights greet you to the north, west, and southeast. The dramatic views also make this an excellent spot for a fire lookout. An interpretive sign near the parking lot will tell you that the current lookout tower is the third to be constructed on Boucher Hill. 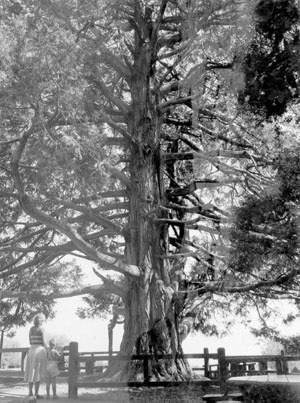 The CCC built the second tower. This home was originally know as the warden's residence. (In the 1930s, the park supervising ranger was called the Park Warden.) The house was saved from the Poomacha fire, thanks to hi-tech fire retardant gel, but the wood sections of the garage burned. The accompanying picture is of the house and garage soon after they were completed. California State Parks is working to restore the garage. An interesting feature to note between parks on this tour: the Mt. San Jacinto State Park warden's residence was built using the same plans as at Palomar, but with massive wooden pillars instead of rockwork. 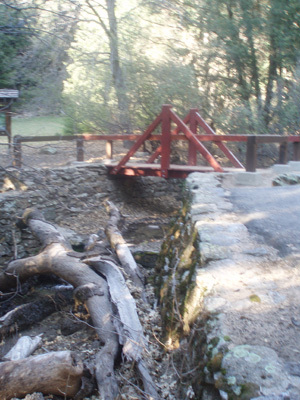 For more information on Palomar Mountain State Park, including driving directions, click here. CCC companies stationed at the Doane Valley CCC camp built the road and telephone line up to Palomar Observatory, a short distance away from Palomar Mountain State Park . For photos of the CCC telephone line project, click here. For an online San Diego Journal of History article about how this scientific project caught the attention of the nation during the Great Depression, click here. 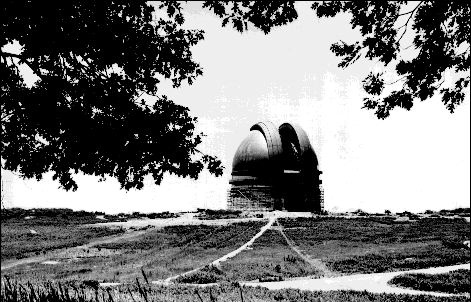 And, for an amusing and inspiring CCC alumnus's account of the work of company 912, who worked on the road to the observatory, among other projects, click here.